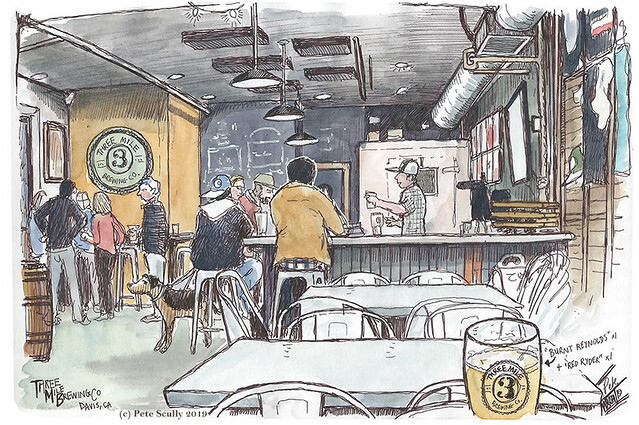 I’ve sketched this place before, it’s Three Mile Brewing in downtown Davis, a small brewery that does some very nice beers. Such as ‘Burnt Reynolds’. There always seems to be dogs in here. There was another one unseen in this sketch, as well as the one that is there. Last time I sketched in here there was a dog in the sketch. Am I now a dog sketcher? I have drawn a few dogs over the years, but I don’t really go for drawing animals much. So, Three Mile Brewing in Davis is named for the old three mile no-alcohol exclusion zone from campus that existed years ago (until 1979!). I like the colour scheme in this room, and it was handy that man wore that jacket providing a balance between the Burnt Reynolds beer and that wall on the left. And so to the last night in England. It was an emotional trip, quick and busy, spent time with family, and friends, and places that I love. The last night there was just mine, all mine. I got back to Burnt Oak and watched old Alan Partridge shows on Netflix while packing my bag, never an easy task after even a short trip, what with all the various books (so many books) and new football shirts (more than one) and Cadbury’s cake bars and packs of Bisto gravy and Topic bars and whatever else I had to get. there was a lot I didn’t pick up. I didn’t get any Daddy’s Sauce, which I adore and am currently out of. For those who don’t know, Daddy’s is a brown sauce very similar to HP but less spicy and just tastes like home. I ate a Pot Noodle for dinner. I have not had a Pot Noodle for quite a long time. They seem a little less satisfying than I remember. I loved them when I was 14. I didn’t intend on ti being for dinner this time, but I left it a bit late to get much else when I finally finished packing my bag and venture back out into London one last time. I had a very early start the next morning and didn’t want to do any last-minute packing. So, I was along in London. I thought I might get some food and sketch an old pub. I wasn’t sure where I would go. London is vast and full of possibilities. I got off the train at Camden Town thinking, I could grab a curry at Masala Zone and then go up to sketch the Steele’s at Chalk Farm. But then at the last second I decided to jump back on the same tube because my head said, “you always go to Camden! Do that another time. London is yours!” So in the spirit of revisiting my youth, I got out at Tottenham Court Road instead. That was always my destination station whenever I would go into London as a teenager. It was right next to the Virgin Megastore – now long gone. It was also right next to the Hellfire Club, where as a 19-20 year old I would jump up and down to loud music with a group of international friends – also now long gone. In fact the station is completely different to the one from the 90s, having undergone a total transformation and rebuild in the past few years. All the old shortcuts are gone, and it’s a large, modern and open station now, not the cramped yellowing ticket hall of the past. I ended up not eating dinner, because I could not find somewhere that I fancied, and I wandered about Soho remembering all the old shortcuts that are thankfully still there. 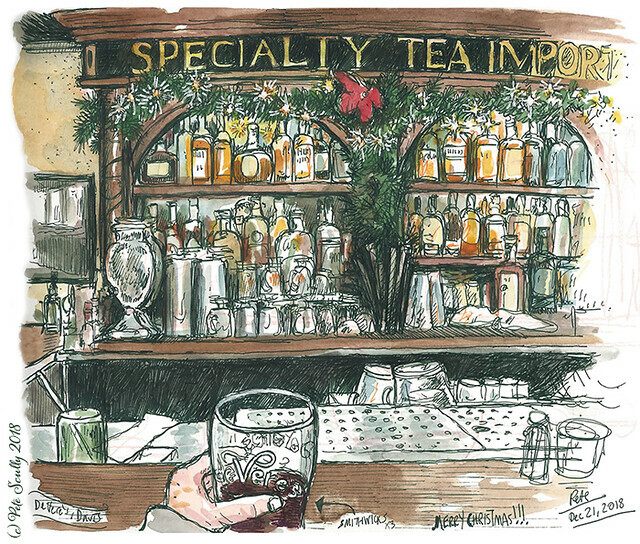 I passed by the Old Coffee House, a pub I have enjoyed a few fun evenings in with friends, one that I have tried to sketch before but at a time without pub-sketching confidence, and I saw through the window that there was a nice seat at the corner of the bar with a perfect panorama sketching view. That seat was mine. I would eat Dry Roasted Peanuts for dinner, hunger be damned. You’ll need to click on the sketch at the top of this post to see it in closer detail (it’ll take you to the Flickr site). As I sketched, I tried a couple of different beers, supplied by a local brewer, Brodies. The first was the Piccadilly Pale Ale, the second and third were the Old Street Pale Ale. I did all the ink at the bar, but added the watercolour paint on the plane next morning (my Stillman & Birn ‘Alpha’ sketchbook being exactly the same width as my Virgin Atlantic economy seat). The bar staff were friendly, and the pub was chilled out. Oh except for the bar fight which broke out behind me. I have discovered that I can apparently sketch undisturbed while a bar fight happens around me, looking up occasionally before getting back to work. Now don’t imagine a long Wild-West style mass brawl, it was more of a few seconds of pushing before a quick “break it up, boys”. There was a group of lads out on a jolly, very drunk and celebrating some birthday or other. I say ‘very drunk’ but it was varying degrees of drunkenness, ranging from ‘friendly and convivial’ to ‘barely able to speak or stand’, with a range of performative drunkenness in between. Two of them for example were enacting a bullfight in the bar, another was sat down loudly singing to a couple of ladies (he was one of the louder ones, but actually he had a very good singing voice), and then one lad who would drunkenly go and sit with random people who would grin and nod a lot back before he sat down with the wrong group of people, one of whom got angry at something or other and they started scuffling, a glass broke, the drunken guy was whisked away and I turned to see one offended young man displaying the classic pose of “hold me back, hold me back”. I didn’t see much more because I was zen-posed with my sketchbook, working to a tight schedule, I had a plane to catch in the morning. The kerfuffles were quickly dealt with by the, I must say, very capable and calming pub staff, who’ve seen it all before I am sure. There was none of that macho make-it-all-worse strutting. The large partying group departed, the broken glass cleaned up, the “hold me back” guy went calmly back to his fresh pint, and the evening went on. I’ve always quite enjoyed this pub, in a little corner of Soho near Carnaby Street, and have been here many times with friends, going back to the 1990s, so I was glad to finally get a sketch of the place. Drawing a pub with lots of details inevitably means you get some wrong, and in this case I drew one too many frames on the wall above the main bar area. You won’t notice, of course. I also drew one person twice. He was standing at the bar waiting for a drink, and then afterwards he had his jacket off and was sat with a woman enjoying conversation. His hair somehow went from black to brown as well but I blame the lighting, not my urban sketching skills. The world is as you see it at that moment (and that of course can change by the third pint). Seen through the window of a barbers in Soho. A popular night-time photo opportunity. As it turns out it, I witnessed two bar fights that night. Typical London, you don’t see one for years and years and then two show up at once. On my way back to the station I popped into another old favourite, The Ship, for a quick pint of London Pride. As I was leaving, it seemed a ruck had broken out just outside between two people who had been in the pub, which was being broken apart by excited pub staff, and people were being directed away from it (so that they could stop and watch, as of course you would do). One rutting stag showed us the true meaning of “hold me back, hold me back”, and did some of the best “hold me back” moves I have ever seen, getting absolutely no fighting done whatsoever, while the main belligerent was drunkenly trying to pick up those metal poles that hold up barriers and swing it around like a broadsword. Maybe someone had asked if he wanted to go clubbing and his Google Translate had mis-google-translated. Security staff did that thing where they multiply, and both men were held back, and the audience started ambling off, as did I, because I had a plane to catch. An entertaining last night in London. It’s almost Christmas! I haven’t had much energy for sketching lately, but I really needed to get some drawing in. I went to see Spider-Man: Into The Spider-Verse (by the way, an awesome film, incredibly creative animation) and then popped into De Vere’s (not Into the Spi-De Vere’s), our local Irish Pub, for some Smithwicks and sketching. It was pretty busy with festive end-of-year partygoers. I sketched in dark green pen. It was really nice to get this sketch done, to get anything done. I’ve been finding it hard to be productive lately, everything seems to take me forever. Actually I have made a lot of things out of Perler Beads. This year I made my son’s advent calendar out of 14,000 of those beads; that was a lot of work. Anyway Christmas is almost here, so I wish you all the very best for the festive season, and hope you go and watch Spider-Verse, because it was pretty great. 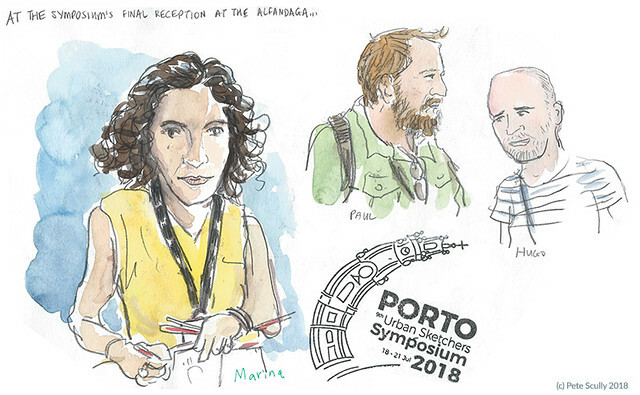 And so here are some sketches from the final evening of the Porto Symposium. 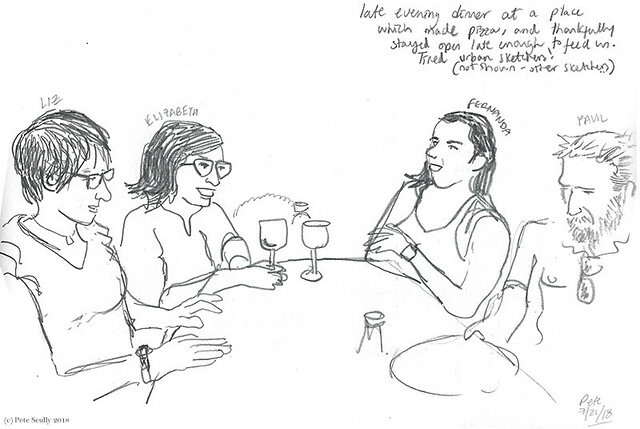 On these final get-togethers we usually spend a lot of time chatting and sketching, often speaking to people we may have not had a chance to see yet (easily done in this 800-large event), before going to dinner very late and generally feeling exhausted. Some wine was also drunk. 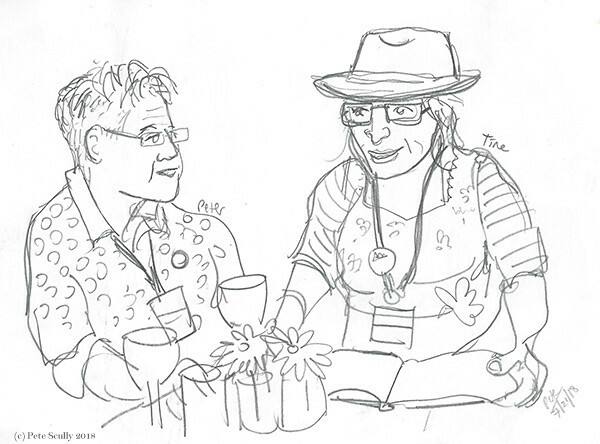 Above, I sketched Marina Grechanik, from Israel, who this year was one of the symposium correspondents and another old urban sketchers friend whose work I’ve admired for years. She has a very creative and playful style (she appeared in my last book, on people sketching) so we drew each other in a portrait duel. I do love portrait duels and wish I could do more of them, I didn’t do enough of them in Porto. Also on this page are Paul Heaston (who of course I know and have followed for years, but didn’t meet until 2016) and Hugo Costa, from Porto, who I’d not met before but whose work is awesome. Below are Arnaud De Meyer, from Luxembourg, who I met in Manchester 2016. I really like his sketching work (especially his two page spreads), and really hope to sketch with the Luxembourg group some day; two sketchers I do not know but were from Germany, Jonatan and Alexandra; and Joe Bean, who I had the pleasure of meeting at a London sketchcrawl in 2016 and whose work I also really admire (in particular his in-construction sketches of Headingley Stadium in Leeds). Below are a couple of sketchers I also met in Manchester 2016, Peter Dutka (UK) and Tine Klein (Switzerland), and though they both had colourful outfits I had didn’t have time to add paint while I stood with them. They both had amazing sketchbooks though, I spent some time looking through them, very productive and creative. 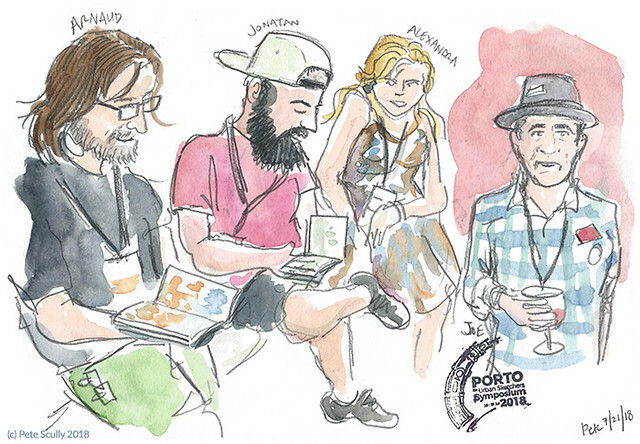 And below, the only other sketch I did, of a very tried and hungry group of urban sketchers – Liz Steel (Australia), Elizabeth Alley (USA), Fernanda Vaz de Campo (Brazil), and once more Paul Heaston (USA). Behind us were several more who I did not sketch. We had tried in vain to get dinner but it was late – late night dinner is less of a thing in Porto, this isn’t Madrid – but we found one place willing to serve us cheese pizza. The waitresses were for some reason very interested in my sketchbook. It was a fun evening, and I can’t wait to see evertyone again in Amsterdam! (Though I did see both Liz and Genine (unseen, at the table behind) in Lisbon a couple of days later). Oh yes, Amsterdam – I didn’t mention, but that is the location of the next Urban Sketching Symposium. Far fewer hilly streets there than Porto! I really hope to go to that one. 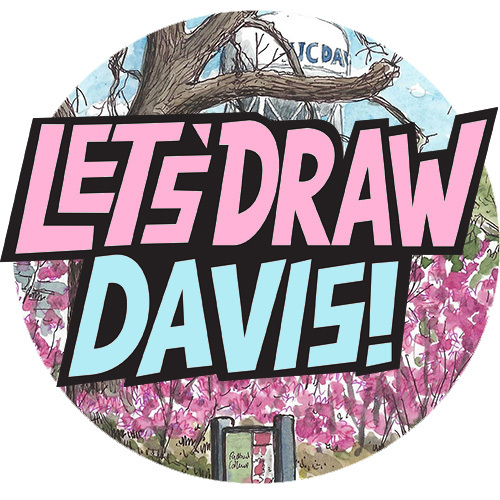 Next time, I will actually tell people I am going, make connections ahead of time, and I’d also like to spend a bit of time in Belgium first, catching up with old places, meeting sketching friends, before the craziness of the Symposium. 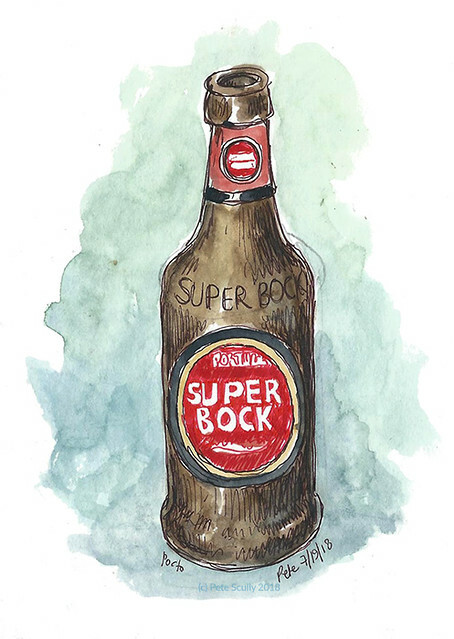 Oh, and one last thing – this is Super Bock. It’s one of two beers you see everywhere in Portugal (the other being Sagres). This is one of the most Portuguese things to sketch. I hope you have enjoyed this trip through Porto with me, I hope I have managed to show some of my enjoyment of this city, but I didn’t see it all and would love to come back some day. I know some friends in England who would love it there. Adeus, Porto! Kwak! A beer I very much enjoyed when I lived in Belgium all those years ago (can I go back there again please, just for a few days, please? I miss Belgium, and have several good sketching friends there). It’s the beer in the funny glass. I still have all the Belgian beer glasses I was given by my amis Belges back in the year 2000, though I actually got this one in England a couple of years later. The big bottle of Kwak was given to me at Christmas, but took me a while to open – that’s a lot of Kwak for one sitting. 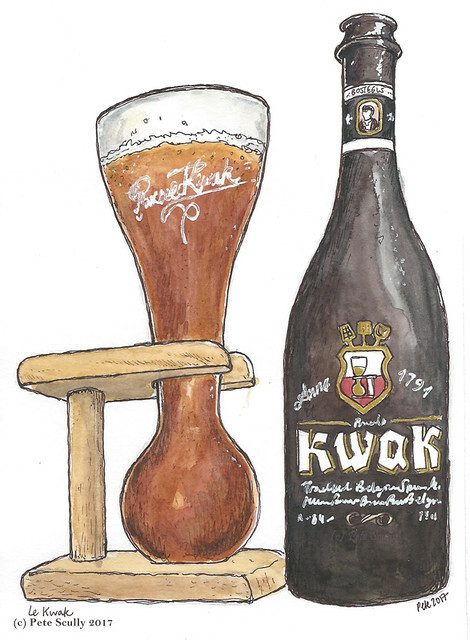 Kwak will always be associated with a funny story about my friend Tel who visited me in Charleroi one weekend, which I recounted in this blog post from 2008, “The night Tel drank the Kwak“. That was funny. We were at my local, La Cuve a Biere, where we ordered a couple of Kwaks, but he drank his too quickly, and then the room started spinning, and everything went foggy (for him, not me, I was alright) and then he spent the best part of an hour in the small toilet of the pub, and it was not pretty. The “Kwak Incident” we called it. I miss Tel, he lives in Japan now. I miss a lot of things, places, people. Memories. That’s life I suppose. I miss recent things such as watching the Thor Ragnarok trailer a few minutes ago, that was so much fun, I miss it already. Difference is I can watch it again in a minute. And lets face it, I’m gonna. That’s gonna be a film I will need to watch with a much bigger glass of beer, Thor style. “Ragnakwak!” One glass I was given in Belgium was one such massive glass, with the words “Tres Grand Soif” on it, and a bell on it for when you need a refill. Santé! More from San Diego. So one of the nicest places there is Coronado, an island city with an absolutely stunning beach. It might be the best beach in the United States. 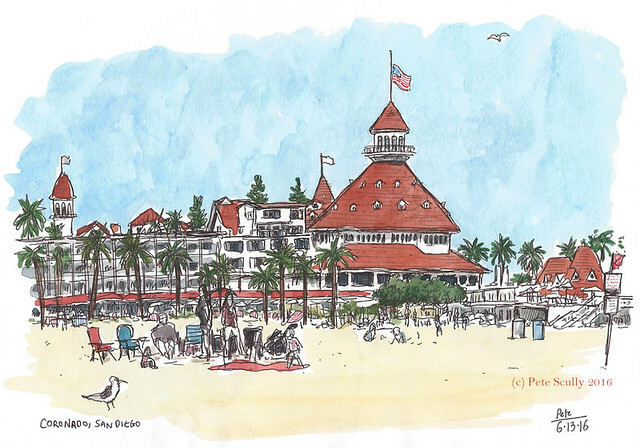 We had a lovely time playing on the beach in the sunshine, and I did a sketch of the historic Hotel del Coronado, “the Del” as my wife kept calling it (nothing to do with Southampton’s old ground, the Dell). It was built in 1888! Back then Jack the Ripper was doing his ripping, the Football League just started leaguing football, the lawn tennis association was founded on a lawn, and Katz’s deli opened in New York, not serving cats. Yes, it’s been around a long time. I sketched it with my feet in the actual Pacific Ocean. I would love to some day sketch the bar area, spend a bit of time doing that, but we had places to go. I did however see a bird flying around inside which flew directly into a window with a thud, cartoon like. I didn’t see it recovering, but I imagined it was on the floor all dazed with little tiny people running around its head. Poor little bird. 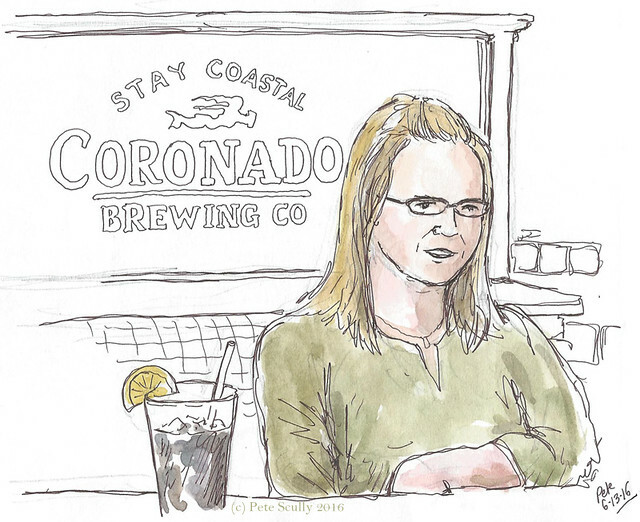 We visited the Coronado Brewing Company, who had lovely beer and food. I drank a Belgian Impaler (while Belgium lost to Italy on the TV nearby) and sketched my wife (above). I ate a lovely mac and cheese dish. A few days later we visited Old Town San Diego. I didn’t do much sketching, other than at lunch. We went to a very colourful cantina restaurant and were serenaded by a couple of Mexican guitarists while we ate. I drew the scene opposite. Mexico is really close by to San Diego, in fact it backs right up to it, conurbating into Tijuana across the border. Here are some other sketches I did. We of course went to the Zoo, and it really is a lovely zoo. 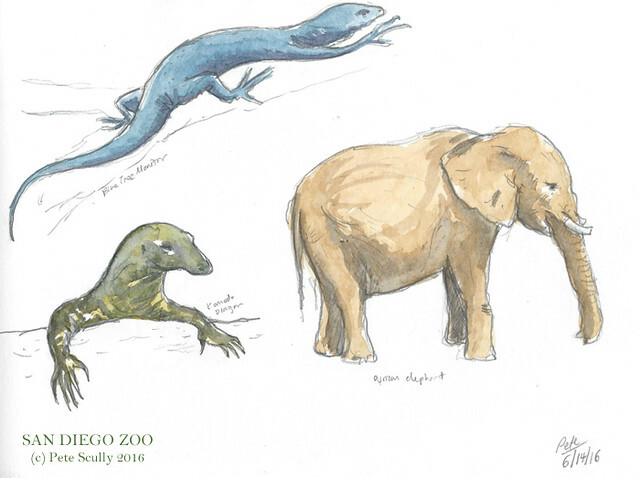 My favourite animals were the pandas, and the elephants. My son loved the Komodo Dragon. I did a few quick sketches in pencil with a little bit of colour. 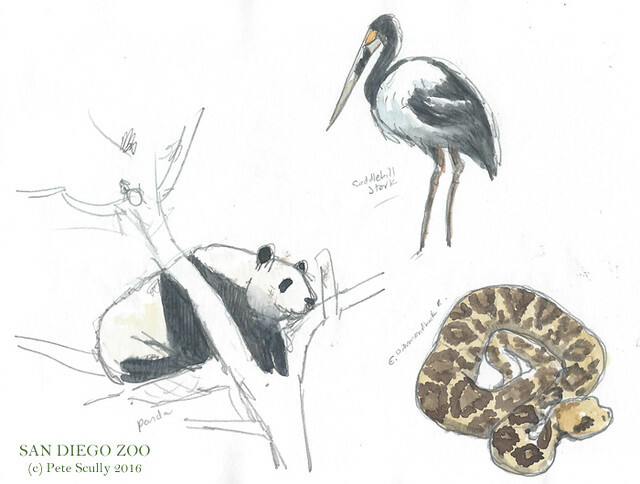 I have a few more sketches from our trip, from Legoland, but on the whole I mostly relaxed, swam in the pool, had the odd cocktail and didn’t check my email all week. Wicked. “Sudwerk Choco-Taco” is an actual beer that I actually had. It’s quite dark, darker than I usually like, but it was really nice, I would have it again. I like trying the different craft beers that we have out here, and in fact I’ve started recording the ones I have tried by using that ‘Untappd’ app on my iPod. Admittedly there are times when it can be hard to remember, so I make a point of writing them down, or in this case, drawing a picture of it. And of course, why draw the glass when you can draw the rest of the bar as well? 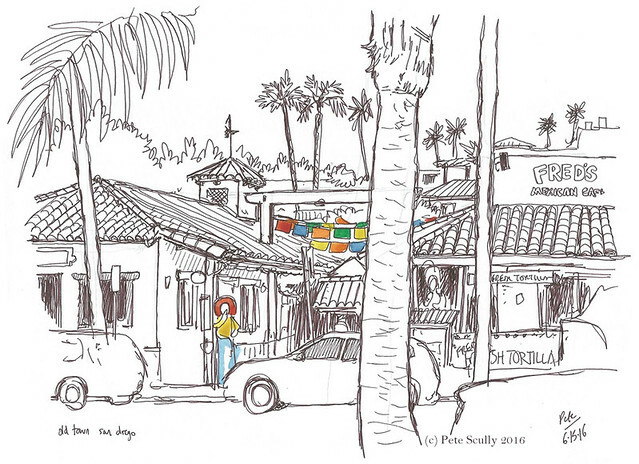 This is another bar sketch of De Vere’s (I do one from time to time, last time was January 2015). I’ve been very busy lately, and so one Saturday night I went and watched Deadpool. By the way, Deadpool is awesome. Don’t take your kids!!!! It will make you laugh. After watching Deadpool, I popped by the Avid Reader to buy Star Wars Top Trumps cards, and then into De Vere’s to read Deadpool comics and do some bar-sketching. The bar-sketching thing sometimes comes down to me needing to sit somewhere and draw a complicated but structured scene. I used a brown-black uni-ball signo um-151 (“say my name!” I hear this pen yelling to me, “say my whole name!”) and also a light grey Tombow marker to mix it up a bit. There’s also some Pigma Graphic pen in there for the thick lines. I had a couple of other beers, a Smithwicks red, which was very nice, and the Aggie Dry Hop lager by Sudwerk, which is alright. I was also celebrating, from 5000 miles away, my older brother’s birthday; he turned 50 on that day. This is a year for milestone birthdays. Wish I could have been there celebrating with him – happy birthday Perks! 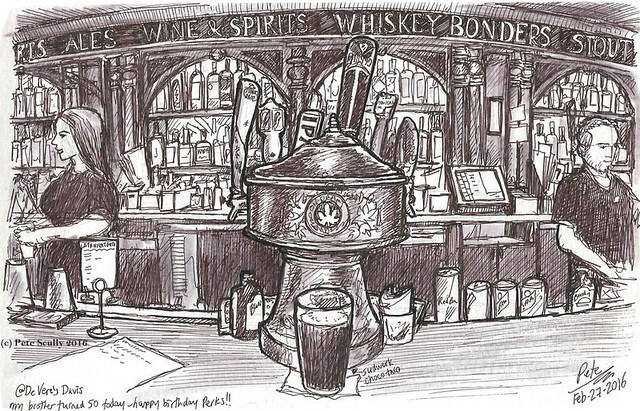 I have some more bar sketches yet to post, ones from New York City. In the meantime if you’d like to see some more, this Flickr set “Pubs, Cafes etc” has loads of mine, from pubs around the world.